The two squares below are exactly alike. They both have sides that equal 102 pixels (102 pixels high by 102 pixels wide. The ratio of height to width in both cases is the same. It is 1:1. Now, let's change that ratio for the image. What would the shape measure if the ratio were 2:1 (2 heights to 1 width? Well, let's double the height to 204 pixels. That would keep the width at 102 pixels. Do you see how shapes change proportions as the ratio changes? OK. Now let's keep the same ratio (2:1) and make the same rectangle one third as small. That means we are going to divide the sides by 3! What are the dimensions for our smaller rectangle that is one third as small? Did we keep the same ratio? 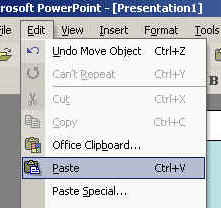 STEP 1: Open a new slide (review previous tasks is you need to) and select the blank slide layout. 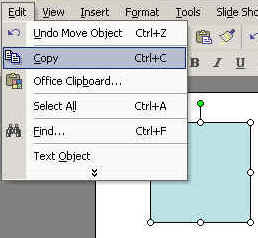 STEP 2:Draw a rectangle using the tools in your toolbar. 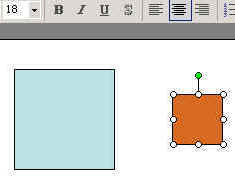 To find out the dimensions of the shape you drew, right-click in the shape. 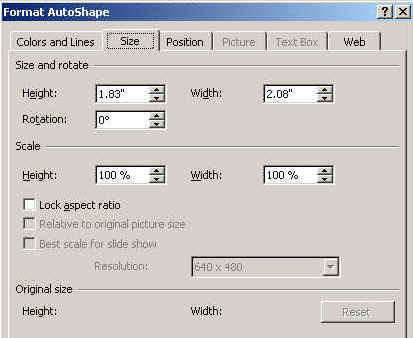 Select Format Auto Shape. When the panel opens study the different information about the rectangle you drew. STEP 3: Click on the SIZE tab. Notice the height and the width information. You can change those in this panel if you want. Notice the LOCK ASPECT RATIO box. If you click that box, you can change the size of your shape, but the ratio and proportions will remain the same. Go ahead and play with that feature. Change the size on the slide and check it. Change the size in the panel and check it. EXERCISE: Using the panel above, make a perfect square. Go to your slide view, and COPY the square (Select the square, and go to EDIT -> COPY). Now PASTE the square somewhere else on the slide. Drag the second square somewhere else on the slide. 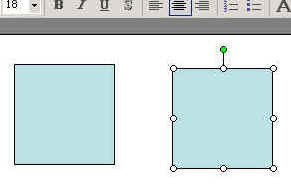 Select the second square and open the same panel you opened before: FORMAT AUTO SHAPE. Click on the SIZE tab. Make sure the RATIO LOCK box is checked. Change the height of the square to half its size. Now the second square is half as big as the other. Select the smaller square and change its color. Print this page, sign it, and place it in your portfolio. 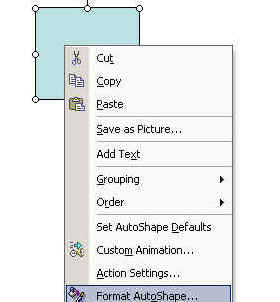 When you are finished, delete the slide with the shapes and save your presentation again.